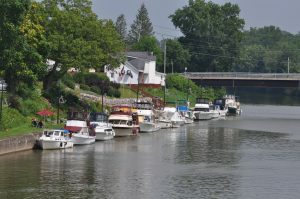 As is the case with many villages along the Erie Canal, Lyons opens its doors to boaters. Located at mile marker 220 last year Lyons had hosted boaters from 34 states, Canada and visitors from 4 countries outside of North America. 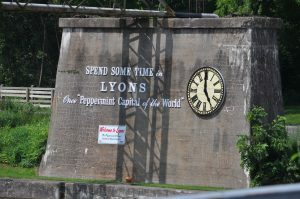 Lyons offers free docking on both the North and South sides of the Canal, Free electric, water, wi-fi and bathrooms with showers are provided at the Lyons Fire House just steps from the Canal Wall. 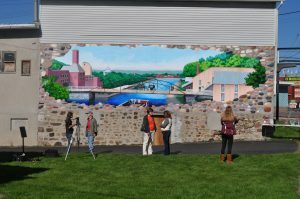 Lyons also participates in the Mural Mania program which promotes the creation of Canal themed murals painted throughout villages along the western section of the Canal. Nearly a dozen large murals depicting life in a small town are displayed around the village. On Sat night, Lyons puts on what is reported to be the largest fireworks display in upstate NY called Thunder over the Erie, the main bridge over the Canal is closed and is filled with spectators, the Canal fills with boats as the NYS Canal Corp keeps the locks open later to allow boaters to enjoy the event. Boaters, don’t forget the NYS Canal System is FREE to all recreational boaters this year in celebration of the Bi-Centennial celebration of the beginning of construction of the Erie Canal. 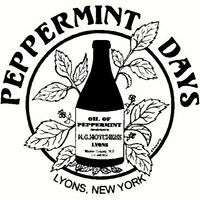 We hope to be there for Peppermint Days again this year. That weekend in Lyons is always a reminder of what Americana is and can still be. Seeing the massive fireworks display from aboard our boat is having the best seat in the house. The folks in Lyons who bring this event to the people are amazing, and deserve many thanks.